When are the reports updated? Why is the number of Ordered Items different from Shipped Items? How can I easily find out more about a specific product from the Fees Report? How can I find all of my previous reports? Can I use the previous reports? Why are some of the transactions marked as 'ineligible for fees'? Is it possible that I see data mismatch between classic and new reporting? How much historical data can I access in the new reports? How do I download reports data? What formats are supported? How do I view and/or download the reports data with a custom date range? How do I create links from reports? Today's Orders: you can now view Today's orders, in addition to historical orders and earnings, in Fees tab. To view Today's Orders, select 'Today' from the date selector in the upper left section and click on Fees tab to see all the items ordered today. You need to click on the Bounties tab to see all the bounties for today. Custom Date Range: you can view reporting data for any custom date range on the page, without having to download. 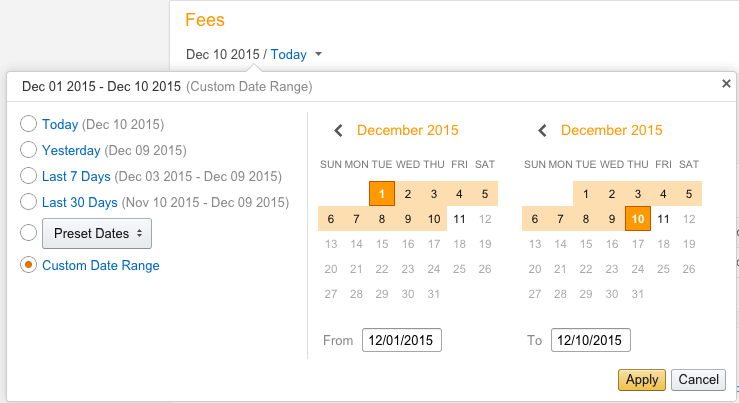 Select 'Custom Date Range' from the date selector, pick any date range spanning less than 30 days and click 'Apply'. 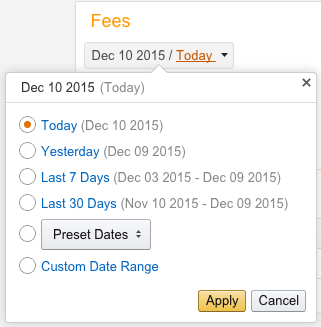 You can also select from the pre-set date ranges, including Today, Last 7 Days and Last 30 Days. Download New Report Types: you can now download Tracking ID Summary, Link Type Performance or Daily Trends report, using the 'Download Reports' link in the upper right section. Daily Trends Report: you can now see the Daily Trends report, in addition to Tracking ID Summary, Link Type Performance and Daily Trends, in the Fees tab. 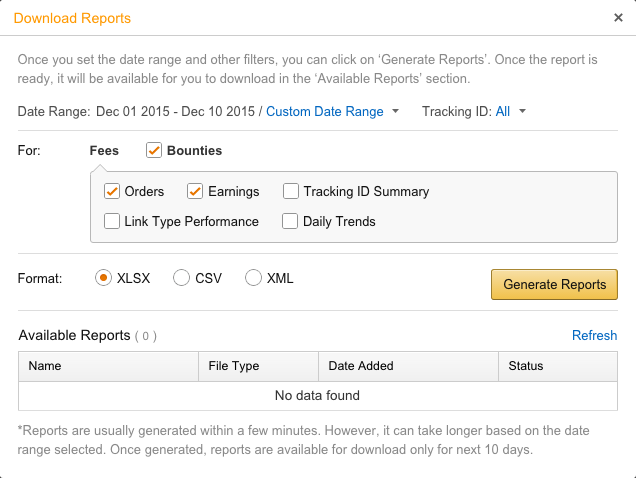 Reports for Ordered Items and Bounties(if applicable) are updated in near real-time, which means most orders will be reported within an hour of being placed. You can see new activity in your account throughout the day. Your Earnings Report is current as of the previous day. For example, if you’re looking at your Earnings Report on Tuesday, you’ll see your earnings through Monday. Some orders customers place may not get shipped. This could happen for various reasons, such as order cancellations within the same day or inadequate inventory levels. How can I find out more about a specific product from the Fees Report? You can click on the product name in the Fees Report and it will take you to the product detail page on Amazon.com. In addition, you can get the link directly from the listing. Data from all of the previous reports – Reports, Earnings Report, Orders Report, Misc. Referrals, Link-Type Report, Daily Trends, Tracking ID Summary Report - are included in the new reporting format in a simplified manner. Previous Earnings Reports, Orders Reports, Link-Type Reports, Daily Trends and Tracking ID Summary report data is now available in the Fees tab. Misc. Referrals data is now available in the Bounties tab. For a limited period, you can use the previous reports by clicking on ‘Return to Classic Reporting’ link on the top right corner. Per our operating agreement, certain conditions and exclusions exist that may disqualify a purchase for earning advertising fees. Refer to Section 7 in the Associates Program Operating Agreement for more details. Once we complete processing your daily earnings, your earnings data should always match between classic and new reports. For orders data, the new reporting system processes orders and cancellations at real time, whereas the classic reports use an end-of-day batch processing. Hence, there might be slight differences in your orders data between new and classic reporting based on the date range and time of the day you are running those reports for. You can access data starting from April 2014 in the new reporting. If you want to keep older data, you should use classic reporting to download it. You can easily see your earnings by program with referral fees and bounties displayed as well as a daily earnings graph. Key performance indicators, like clicks, ordered items, shipped items and conversion rates are surfaced to provide you insights at a quick glance. Today's Orders provide you with near real-time order data. You can choose to view this data for a single Tracking ID or for all Tracking IDs by selecting the appropriate Tracking IDs using the Tracking ID filter near the top of the page.